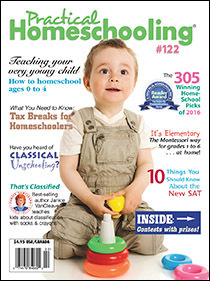 Practical Homeschooling magazine is published 5 times a year: March, May, July, September, & November. Now in its 21st year of publication, “PHS” has helped hundreds of thousands of homeschool families succeed. We have no writer's guidelines per se. Rather, we ask you to briefly share your article idea with us as well as your background -- e.g., why you feel knowledgeable enough to write it. If we think it's appropriate and we have the space, we'll ask you to submit the article. If we then like the article, we send you our one-page Article Rights agreement for you to sign, which outlines your and our rights, the payment terms, etc. $50 per article, including photographs.